Derailleur Hanger Olympia Boost 2012 size 1:1 scale. Made in Italy. 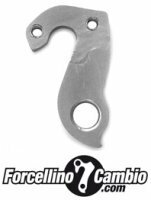 Olympia Kobra 27,5 2015 derailleur hanger 6061 T651, made with CNC technology. Black anodized. Lighter and more durable than the hanger series. Olympia Nitro bike model year 2010 in 5086 aluminum CNC machined Made in Italy . Hole spacing 19mm threaded center center . Derailleur hanger Olympia Rsx Plus 2007. 5086 aluminum CNC machined Made in Italy. In actual size 1:1 scale. Derailleur hanger Olympia Speedy Plus road. Derailleur Hanger Olympia CSL X in actual size 1:1 scale. Made in Italy. Derailleur Hanger Olympia Extreme 2001 in actual size 1:1 scale. Made in Italy. Olympia hammer Carbon derailleur hanger 6061 T651, made with CNC technology. Black anodized. Lighter and more durable than the hanger series.